Among the Nine Durgas, Maa Shailputri is considered to be the first manifestation of goddess Durga. She carries the trishul and the lotus in her hands. Her vehicle is the Bull, Nandi. The narrative regarding her birth has been described in scriptures like Shivapurana and Devi Bagvaatam Maa. Shailputri in her previous birth was born as a daughter to Daksha Prajapati. She was named ‘Sati’. She had been deeply devoted to Lord Shiva since her childhood. When she grew into a maiden, she propitiated Lord Shiva by her penance and devotion and desired to beget him as her consort. Lord Shiva bestowed the desired boon on her and accepted her as his consort. Once her father Daksha Prajapati organized a great Yagya in which all the gods including Brahma, Vishnu, Indra and saints and sages were invited, but Lord Shiva was excluded. When Goddess Sati came to know of it, she could not tolerate the disgrace of Lord Shiva. Seeing the infuriated Sati, Lord Shiva said to her, “O Goddess! It does not behoove you to lose your temper over such a trifle. Daksha Prajapati is the performer of this great sacrifice. Sati’s anger did not subside even after such a lecture given to her by Lord Shiva. Seeing her great obduracy, Lord Shiva ultimately granted her the permission to see her father. When Goddess Sati reached the site of the Yajna, she heard everybody denouncing Lord Shiva. Even Daksha, her father, surrounded by his servants was busy with the condemnation of Lord Shiva. All her sisters were mocking at Sati. Such a hostile situation fanned the fire of her fury even more. She failed to endure such a horrible disgrace of her Lord and consigned herself to the sacrificial flames. When Lord Shiva heard of Sati’s self-immolation, he sent his attendants to destroy the sacrifice. Sati in her next birth was born as a daughter to Himalaya, the Lord of Mountains. She was named Parvati or Hemvati. Since she was born as a daughter to the mountain-king Himalaya, she is also known as Shailputri. She propitiated Lord Shiva by her severe penance and begot him has her husband. 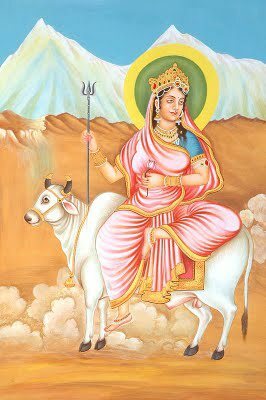 Among the Nine Durgas, the importance and powers of Mother Shailputri are unlimited. On the first day of auspicious Navaraatri, she alone is adored and worshipped.